← Congratulations to senior Marissa Kivi! 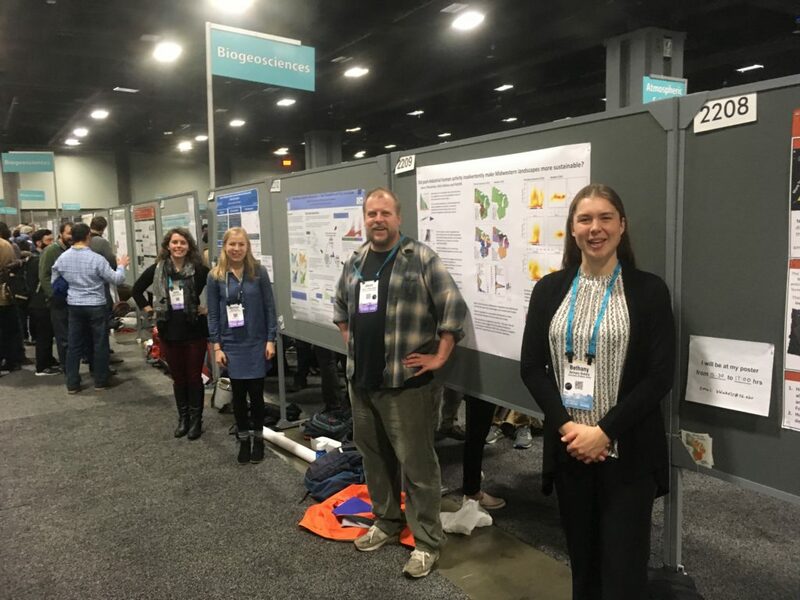 The McLachlan lab represented at AGU (American Geophysical Union) this year! We had five lab members of the lab present. 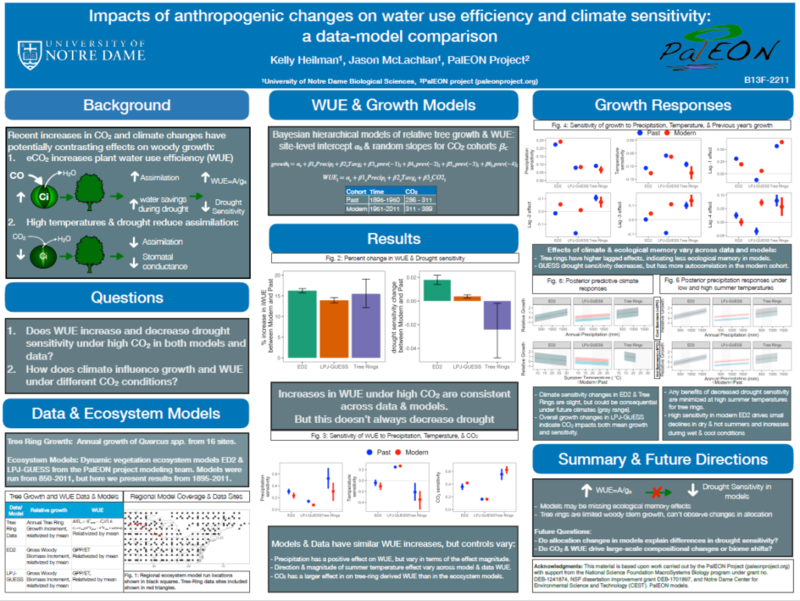 There were four posters presented by graduate students, Kelly Heilman and Bethany Blakely, undergrad Marissa Kivi, and Jason. Graduate student, Ann Raiho gave a talk. 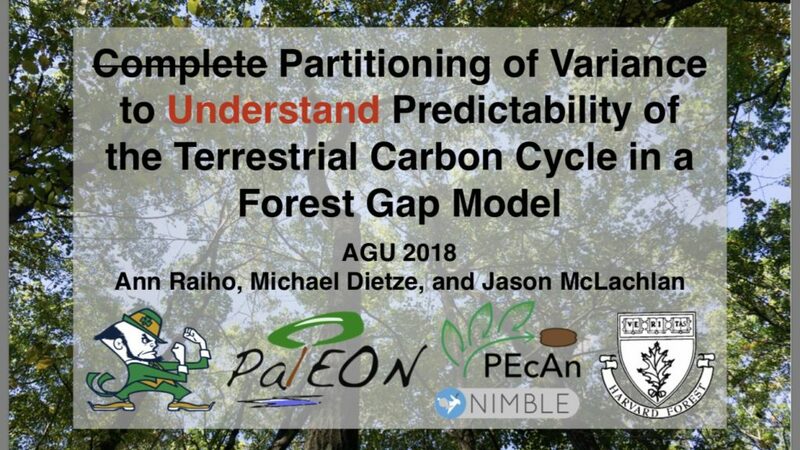 This is a nice overview of the type of research the McLachlan lab is conducting to examine forest dynamics through time. Details of their posters and talk can be found below. Click on each image for a larger view of the posters and presentation. Ann gave her talk on Thursday, December 13, 2018. Ann’s research uses state data assimilation with the forest gap model LINKAGES to examine forest carbon. Ann’s goal was to determine what specific factors attribute the most to the uncertainty in the model output. She found that initial conditions and process variance are key sources of uncertainty. 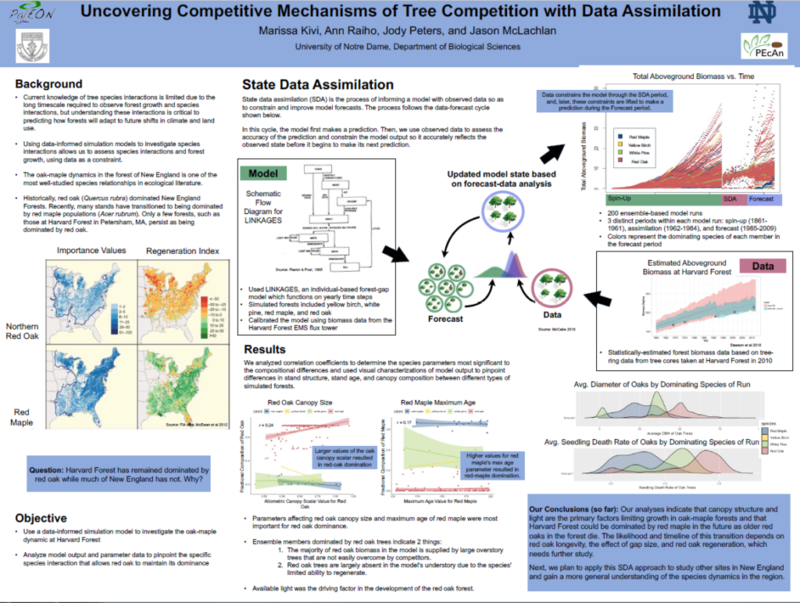 Marissa’s research uses data assimilation and the forest gap model LINKAGES to investigate the oak-maple dynamics at Harvard Forest. Analyses from the model and parameter data indicate that canopy structure and light are the primary factors limiting growth in oak-maple forests. 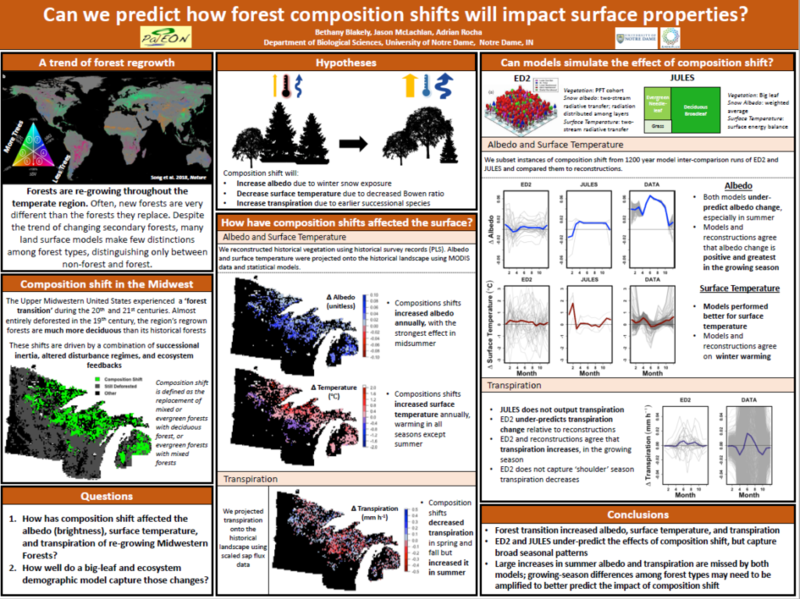 Bethany examines how the forest transition in composition over the 19th and 20th centuries has affected the albedo, surface temp and transpiration of Midwest forests and assesses how well ecosystem models capture these changes. Kelly studies how the increases in CO2 and climate change influence water use efficiency and growth of trees as seen through tree rings and ecosystem models. 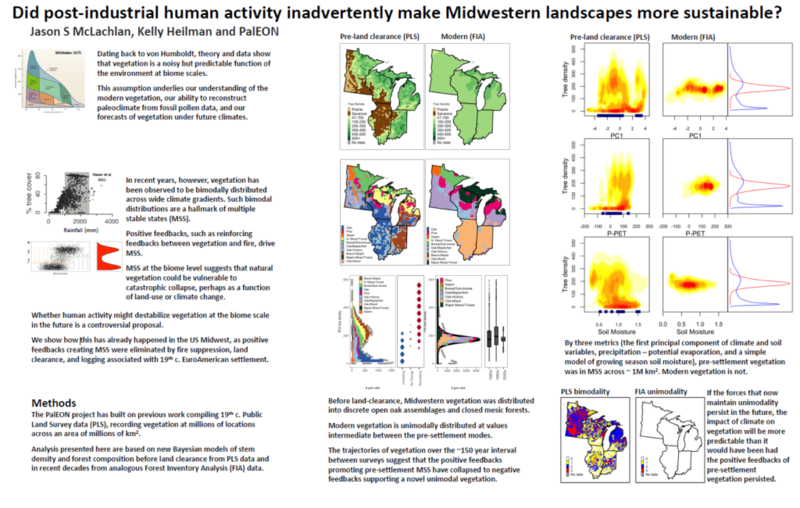 Jason’s poster feature changes in Midwest vegetation. In the 1800s the vegetation was distributed in a multiple stable state of discrete open oak assemblages and closed mesic forests which was promoted by positive feedbacks. Over the past 150 years, vegetation has transitioned to an intermediate unimodally distributed state which is now perpetuated via negative feedbacks.